The photos that follow are an actual example of the problems that can be encountered when a building is built without a proper building permit or plans review by a Code Official. 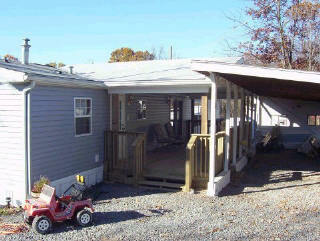 A contractor built this deck and roof to connect a mobile home with a carport. 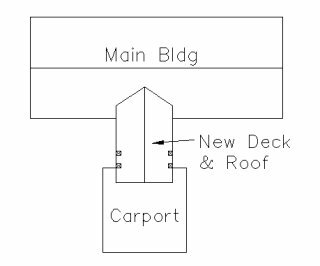 Since the deck and roof were attached to the primary dwelling, a building permit was required, and the deck and roof should have been placed on a foundation or piers extending below the frost line. Many of the problems which must now be corrected could have been caught in the plan review stage, saving both the homeowner and contractor considerable time and expense. 4. No joists restraining rafters; no plate or header to support rafters (photos 6 and 7) Ref: IRC Section 802.3.1 requiring ceiling joists and rafters to be nailed to each other … and the assembly to be nailed to top wall plate. IRC 905.2.8.2 requires closed valleys (valleys covered with shingles) to be lined with 36” wide roll roofing, specialty underlayment, 24” wide metal, or two layers of 18” and 36” wide mineral surface roofing. Ref: IRC 319.3 Fasteners for pressure preservative and fire-retardant-treated wood shall be of hot-dipped galvanized steel, stainless steel, silicon bronze or copper. 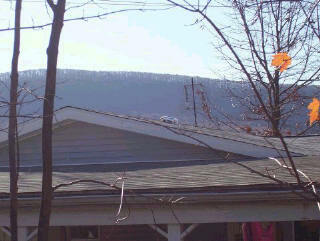 Ultimately, the homeowner hired another contractor to remove and replace the deck and roof. This contractor submitted plans for review, and called for the required inspections as the work progressed. 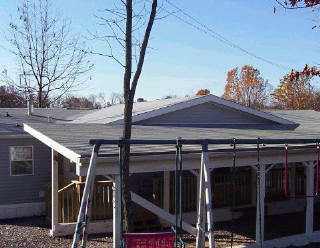 The work passed all of the inspections and the homeowner is very pleased with the completed project. Photos 18-20 show the completed project..